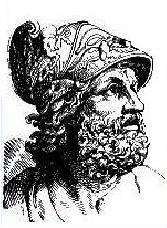 Menelaus of Alexandria (/ˌmɛnɪˈleɪəs/; Greek: Μενέλαος, Menelaos; c. 70 – 140 CE) was a Greek mathematician and astronomer, the first to recognize geodesics on a curved surface as natural analogs of straight lines. Although very little is known about Menelaus's life, it is supposed that he lived in Rome, where he probably moved after having spent his youth in Alexandria. He was called Menelaus of Alexandria by both Pappus of Alexandria and Proclus, and a conversation of his with Lucius, held in Rome, is recorded by Plutarch. Ptolemy (2nd century CE) also mentions, in his work Almagest (VII.3), two astronomical observations made by Menelaus in Rome in January of the year 98. These were occultations of the stars Spica and Beta Scorpii by the moon, a few nights apart. Ptolemy used these observations to confirm precession of the equinoxes, a phenomenon that had been discovered by Hipparchus in the 2nd century BCE. Sphaerica is the only book that has survived, in an Arabic translation. Composed of three books, it deals with the geometry of the sphere and its application in astronomical measurements and calculations. 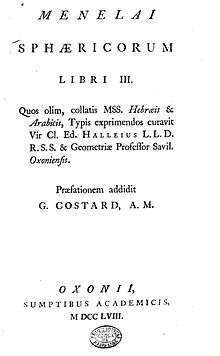 The book introduces the concept of spherical triangle (figures formed of three great circle arcs, which he named "trilaterals") and proves Menelaus' theorem on collinearity of points on the edges of a triangle (which may have been previously known) and its analog for spherical triangles. It was later translated by the sixteenth century astronomer and mathematician Francesco Maurolico. The lunar crater Menelaus is named after him. He may also have written a star catalogue. ↑ Encyclopaedia Britannica "Greek mathematician and astronomer who first conceived and defined a spherical triangle (a triangle formed by three arcs of great circles on the surface of a sphere)." Ivor Bulmer-Thomas. "Menelaus of Alexandria." Dictionary of Scientific Biography 9:296-302. Pedro Pablo Fuentes González, “Ménélaos d’Alexandrie”, in R. Goulet (ed. ), Dictionnaire des Philosophes Antiques, vol. IV, Paris, CNRS, 2005, p. 456-464. O'Connor, John J.; Robertson, Edmund F., "Menelaus of Alexandria", MacTutor History of Mathematics archive, University of St Andrews .